Chambers Log Scriber, Starrett Scriber, Mackie Scriber and Pen Tools - Specialty Log Building Tools - Magard Ventures Ltd. BC Canada. The world's first scriber designed from the ground up for log home construction. Can be used for horizontal scribing (stairs, roof systems, drywall) and laser scribing (precision-milled hole for standard bore-sight lasers) and includes a built-in lanyard hole for carrying on your tool belt. Great Pens: Fisher Space Pens work at ALL angles and even write underwater. The best ink pens for scribing logs. Ball-point tips so pens do not wear down and the pens and holders are slim so they fit into tight spaces in notches. Each scriber comes with: 2 pens, instructions, tool kit and hard carrying case with ripple foam interior. T-01-020A NLA Chambers Log-Scriber, top arm with arc; black or blue pens. Shure Ultra Scriber, self-leveling dual scriber, c/w Fisher black space pens. Now comes with a lockable, durable foam lined protective case. Lock not included. Natural House gear head scriber, dual self-leveling, c/w Fisher black space pens. Comes complete with a foam lined protective case. The rigidity, light-weight, and easy handling advantages of the Starrett divider make it the favorite of log builders everywhere! The features of this divider include steel construction, forged legs, quadrant, knurled lock nuts and tempered points. This sturdy construction overcomes the possibility of the legs moving with the grain when scribing. The dual vial bubble attachment is fully adjustable. It rotates 360 degrees thus facilitating both vertical and horizontal scribing. The Starrett divider combined with the rear mount dual vial bubble attachment makes this unit the most popular log scriber we have ever supplied to students, individual home builders and contractors. Since the early 1970’s more homes have been built using Starrett scribers than any other scriber. This unit is practically a must for accurate and tight fitting joints. B-01-085 $309.99 9” Starrett scriber with two adjustable legs & rear dual bubble attachment (#85) (most popular Starrett). C-01-087 $314.99 12” Starrett scriber with two adjustable legs and rear bubble attachment. $279.99 9” Starrett scriber with one adjustable leg and rear dual bubble attachment (#92). E-01-094 $269.99 6” Compact Starrett scriber with one adjustable leg and dual bubble attachment. Z-01-073 $84.99 NEW # 73B-12 Starrett 12" quick spring nut inside caliper,split spring nut quickly adjusts and locks your setting. F-01-043 $99.99 Side mount level attachment only (for Starretts) with mono (single) bubble. G-01-047 $99.99 Rear mount level attachment only (for Starretts) with dual vial bubble. H-01-024 $33.00 Angle pencil adapter for Starretts (.295” hole) for Veritos pencil. I-01-025 $33.00 Angle pencil adapter for Starretts (.285” hole) for Stabilo pencil. J-01-026 $33.00 Angle Staedtler pen adapter for Starretts (.375” hole). M-01-044 $99.99 Rear mount level attachment only (for Starretts) with mono (single) bubble. N-01-045 $5.95 Replacement mono bubble. NEW Protect your valuable log scriber in this durable & lockable foam lined pistol case. 11.6" X 7.3" X 2.0" inside dimensions. Lock not included. This scriber was designed by intellectual B. Allan Mackie, world renown log builder, instructor, and lecturer. This scriber has many features which adapt it specifically as a log building scriber. The main body is constructed of aluminum, the point and axis rod of stainless steel, and the nuts and bolts of brass. These metals feature durability, sturdiness and resistance to corrosion. Other features are capability of using full length pencil and steel point at either straight or 24 degree angles and dual vial bubbles. These bubbles are visible from top, side and bottom for an over head, eye-level or low scribe. A cut-out on one side of the rotating level unit allows it to be functional for left or right handed scribing as well as vertical and horizontal scribing. All these features make this a premium quality log scriber with many benefits for the log builder. A-01-079 $279.99 9” Mackie deluxe dual scriber assembly. R-01-080 $21.99 Staedtler felt pen adapter for Mackie scriber (.375” hole). this chrome plated steel scriber is capable of a single or double scribe. It has a top mounted dual vial level and is easy to adjust. It is very sturdy and comfortable in your hand. S-01-069 $99.99 9" Double silver scriber. This Canadian made steel log scriber is very rigid and features a top mount double bubble level. It requires minimal adjustment and comes with a single pencil capability or as a deluxe dual scribe model. This Canadian made aluminum scriber (shown in image above as #P) can be used as both a transfer and a log scriber. The dual bubble vial offers a wide range of adjustments. The pencil and point can be set at numerous angles. 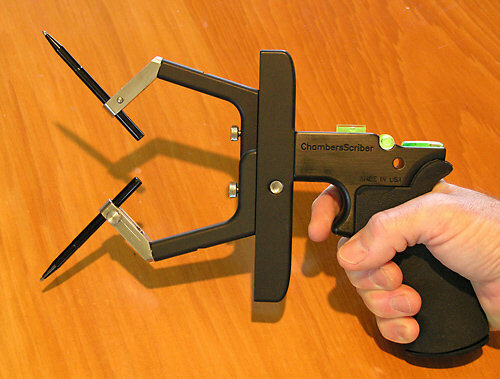 This scriber is capable of both single and double scribes either vertically or horizontally. A good light-weight scriber. Includes a sturdy foam-lined plastic case. 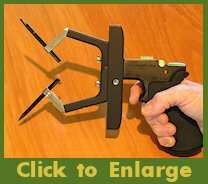 M-01-031 no longer available 10” deluxe dual Woods scriber; pencil & point angle is adjustable. When this tool is attached with screw to a convenient, stable base and adjusted plumb with its several adjustments, it is then invaluable in quickly and easily leveling your scribers. M-08-685 $149.99 Scribe leveler plate. Our selection of scribing pencils and pens include quality brands such as Atco, Veritas and Sanford. Pencils and ink can be purchased singly or in packs of 10. We also carry 4 sizes of Staedtler Lumocolor felt pens and standard lumber crayons. A-01-001 $3.50 Atco carpenter pencil 9 1/2” 1/3 indelible, 2/3 regular. A-01-002 $30.00 Atco carpenter pencil 10 pk. B-01-003 $2.19 Veritas indelible pencil red. B-01-004 $19.99 Veritas indelible red 10 pk. C-01-009 $2.19 Veritas indelible pencil purple. C-01-010 $19.99 Veritas indelible purple 10 pk. D-01-011 $2.29 Stabilo All indelible pencil,graphite colour,very durable graphite. D-01-012 $21.99 Stabilo All indelible 12 pk. E-01-005 $3.49 Staedtler Lumocolor felt pen, medium point (.040”) black. E-01-006 $3.49 Staedtler Lumocolor felt pen, fine point (.024”) black. E-01-007 $3.49 Staedtler Lumocolor felt pen, super fine point (.016”) black. E-01-008 $3.49 Staedtler Lumocolor felt pen, fine point (.024”) blue. F-01-013 $1.75 Lumber crayon, marks on wet and dry wood black. G-01-014 $23.99 Lumber crayon holder.